A Holbein stitch ( Double running stitch) is a reversible stitch. This stitch is made in two stages. First, going onward with a line of running stitches and then going backward to fill the spaces between the running stitches. It can be used for straight lines ,curved lines and outlines, it is also used in blackwork embroidery. A lot of embroiderers like to work the Holbein stitch on Aida fabric or even-weave linen. Since the Holbein stitch is a form of counted thread stitch, it will works out a very well result on Aida fabric or even-weave linen. Anyway it doesn't mean we cannot make it on other kinds of fabrics. If you are choosing another kind of fabric, you should transfer/draw grid marks on the fabric for an easy stitching especially for the complex patterns. Here show you the steps how I make the Holbein stitch on a piece of clothing fabric. Work a line of running stitches, the stitches should be equal in length to the spaces between them. Turn the work and start a return journey with the same working thread (or use a contrast coloured thread) stitch through exactly the same holes to fill the spaces between the running stitches. The third photo shown is two lines of Holbein stitches with one color and two colors respectively. Usually, I will use a contrast colored thread on the return journey for creative effects. Apart from creating straight lines by Holbein stitch, I have tried to create a simple Vs pattern with Holbein stitch. The photo below shows how I create the Vs pattern. I don't draw grid marks for this pattern because this is only a short and simple pattern, I only draw three lines on my clothing fabric. Anyway, you can draw a complete grid marks to get a good result. Insert the needle at point A from the back and pull the thread through the fabric completely, then insert the needle into point B and come out at point C, pull the thread out to create the first stitch. Now, create the second stitch by inserting the needle into point D and come out at point E. Pull the thread through completely. Insert your needle into point F and come out at point G. Pull the thread through and now the third stitch is formed. 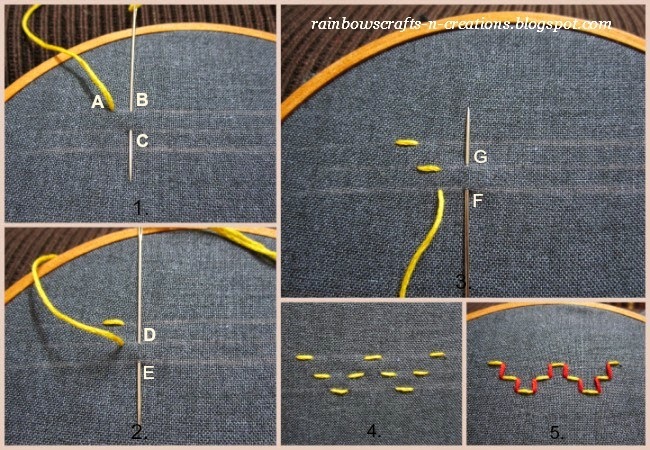 Follow the steps like what you have done just now to create the other horizontal running stitches. Finally, you can get a pattern as shown in the photo no.4. Do a return journey by filling up all the spaces between the stitches with other contrast coloured thread. This time all the stitches should be vertical. The last photo shown is a finished Vs pattern.